Hotel Springfields of Shimla is a heritage property run by Usha Lexus Hotels. Originally it was built by Mohammad Yahya Khan, an aristocrat from Lahore. The property comprised of the main house, two outhouses and stables. 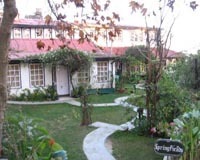 With a colorful history, Springfields remains the only one of its kind in Shimla today. Springfields is situated at a little distance from the Mall - the famous Shimla promenade in the peaceful and verdant surroundings of Chotta Shimla. Airport 17 kms, Railway Station 7 kms, Roadways Bus Stand 6 kms.